Once in a while, I have to let one go. But if I am going to part with a “private vault piece” in my collection, I have to be assured that it is going to a private collector. 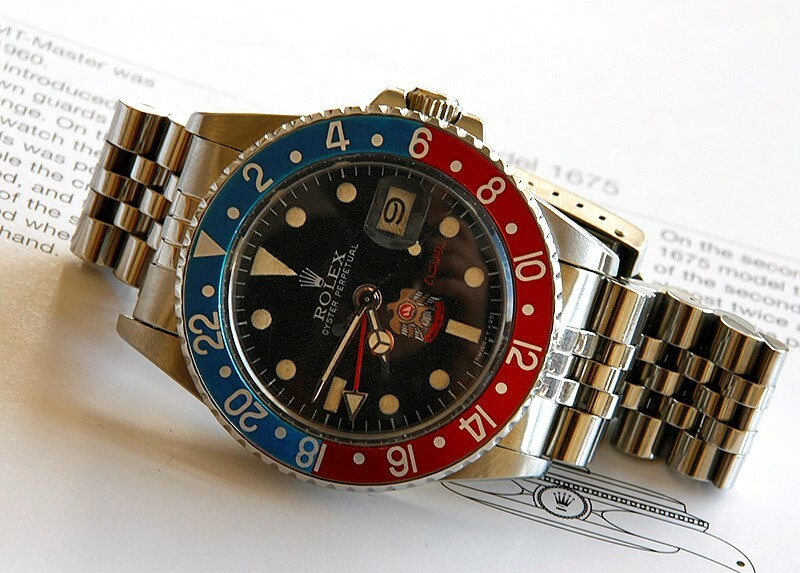 The watch here is an Uber Rare Rolex GMT 1675 with a special UAE crested Dial, in all original “unpolished” condition. Spectacular? Yes! 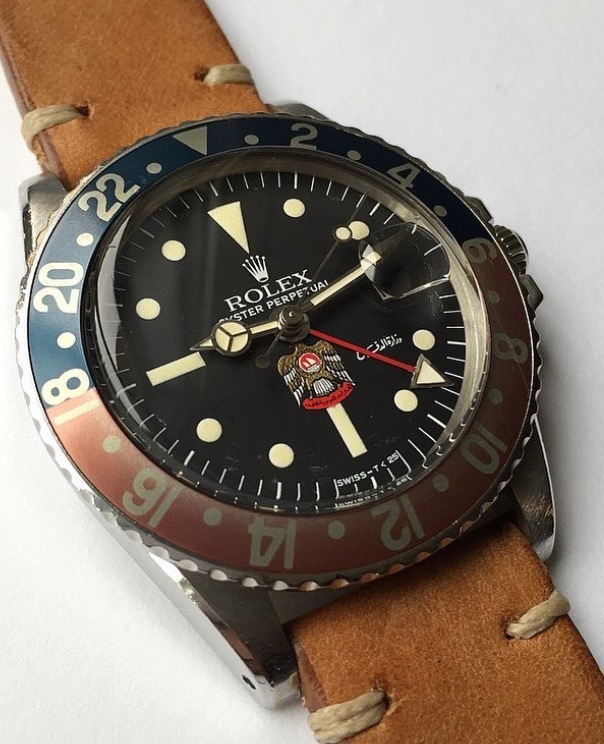 At Bob’s Watches we see a lot of superb vintage Rolex watches and once in a while, we come across a truly standout piece that is not only rare, but boasts an interesting story too. 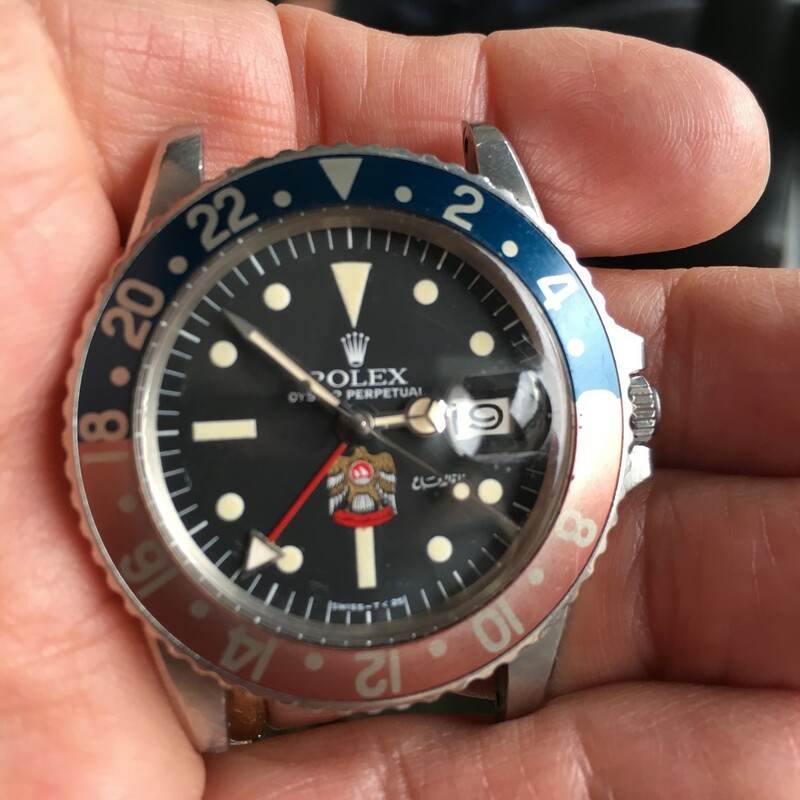 This GMT-Master 1675 features a custom made dial created specifically for the government of the United Arab Emirates (UAE) and we are pleased to announce that it has recently been purchased from Bob’s Watches. 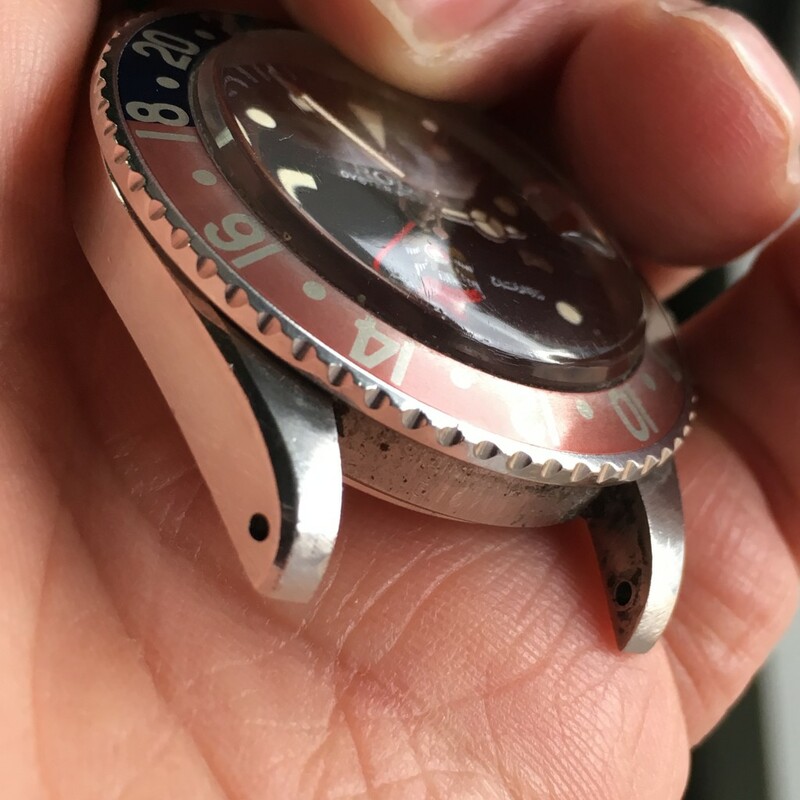 The GMT-Master with this special crest was originally for those who worked in the UAE government. In a culture where gift giving is very common, Rolex has always been the brand of choice in the Middle East, prized for its prestige, status, and fame. 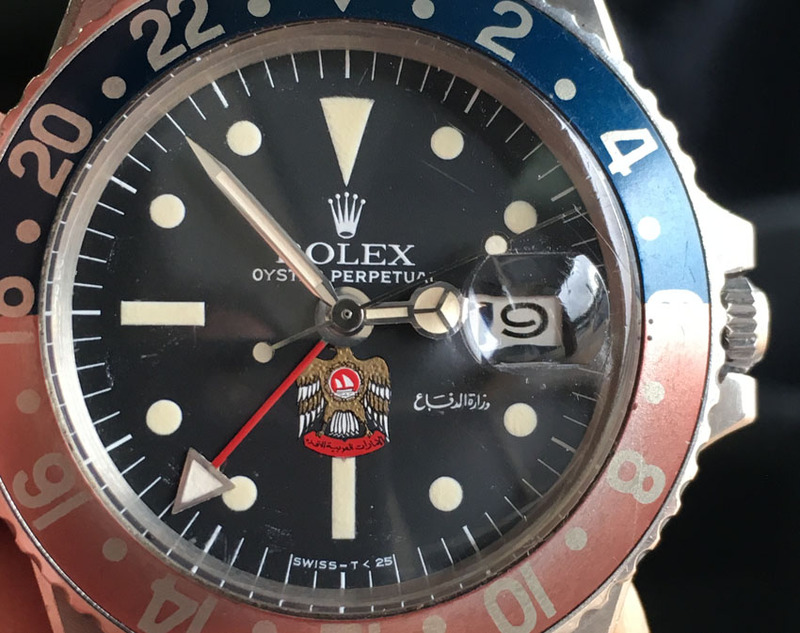 In the in 1970s, the government of the UAE commissioned special editions of the GMT-Master 1675 furnished with custom-made dials featuring the national coat of arms in addition to “Ministry of Defense” written in Arabic on the right of the crest. The national emblem of the UAE, also referred to as the “Qurayash Hawk”, is featured prominently on the black matt dial just above the 6 o’clock hour-marker. The hawk, or falcon, is particularly significant in Emirati culture as falconry – the practice of using a hawk or falcon to catch prey in the desert – is a very important part of their tradition. On the chest of the bird lies a red circle depicting a picture of a dhow, which was the sailboat of choice throughout the history of that geographical area, and below the talons of the hawk we see “United Arab Emirates” written in Arabic on a red banner. Custom-made dials featuring the national coat of arms. It is said that some of this special edition GMT-Master 1675 “UAE Ministry of Defense” were issued to the helicopter pilots serving in the country’s military, while some of the watches were gifted by government officials to people who had served the nation of the UAE in some official capacity. For instance, during Christie’s Rare Watches & Important Discoveries watch auction that took place December 15, 2015, a very similar GMT-Master 1675 was among the sale lot. Christie’s particular GMT-Master 1675 “UAE Ministry of Defense” was a given to an English gentleman by the Emirati government for his contribution to the country’s irrigation development. The watch sold for $93,750, which was more than triple its pre-sale estimate of $20,000 – $30,000. An unpolished with Original Bevel Edges, such a rare feature. The UAE’s Quraysh Hawk limited edition dial is exceptionally rare to find in the current market since not only were they produced in restricted quantities during an eight-year production run from 1971-1979, they are also becoming increasingly popular among today’s collectors, especially with those who are fond of military Rolex watches or Arabic dials. We are happy that this rare bird found a new home with an avid collector who will truly appreciate its vintage qualities and story, and we don’t expect to see another one like it anytime soon.